Whether the dreams brought on the fever or the fever brought on the dreams Walter Gilman did not know. His ears were growing sensitive to a preternatural and intolerable degree, and he had long ago stopped the cheap mantel clock whose ticking had come to seem like a thunder of artillery. 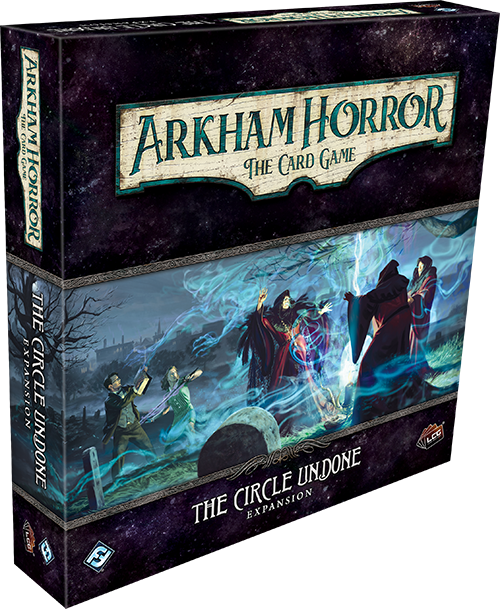 In The Circle Undone, the fourth deluxe expansion for Arkham Horror: The Card Game, you return to witch-haunted Arkham, where four citizens have recently disappeared from the estate of one Josef Meiger. 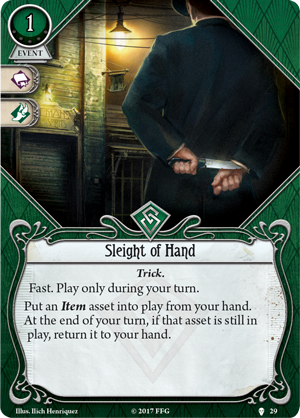 Throughout two scenarios and a playable prologue, your team of investigators must confront the truth of Arkham’s dark past and battle your own minds to protect your home and restore some sense to a city teetering on the edge of madness. Today, we're pleased to introduce you to Carolyn Fern and Rita Young, just two of the investigators that you can add to your team in The Circle Undone—now available for pre-order at your local retailer or online through our website! Carolyn Fern dwells in the minds of others. Using a complex form of hypnosis, she studies the psychology of her patients through their dreams. By using this practice, she has seen and heard many disturbing things. Some patients claim to travel to other realms in their sleep, or they tell her of terrible creatures that haunt their nights. Her research has led her from one bizarre case to another, and yet, she seems no closer to truly understanding the horrors of the world around her. Even so, Carolyn will not give up until she can uncover the root of this madness that seems to follow her career. As your investigations continue into The Circle Undone, you will see that Carolyn Fern (The Circle Undone, 1) is new breed of Guardian. As a doctor, she does not play into the traditional role of a fighter, possessing a combat score of two and the restriction that she cannot hold any Weapon cards between levels one and five. 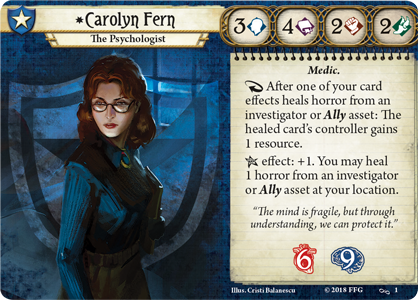 Rather, Carolyn's mission is to protect those in her care, strengthening their minds by healing one horror from a nearby Ally or investigator whenever she draws the elder sign token. 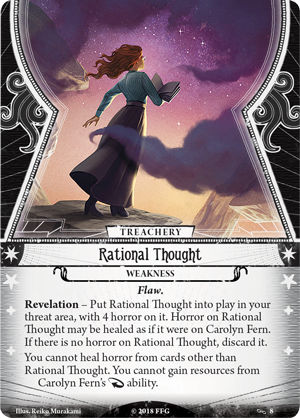 With her ability to not only heal her friends, but also fund their missions, Carolyn encourages players to re-examine this class and fully embrace the cooperative nature of Arkham Horror: The Card Game. This is not the psychologist’s first time confronting the powers of the mythos. 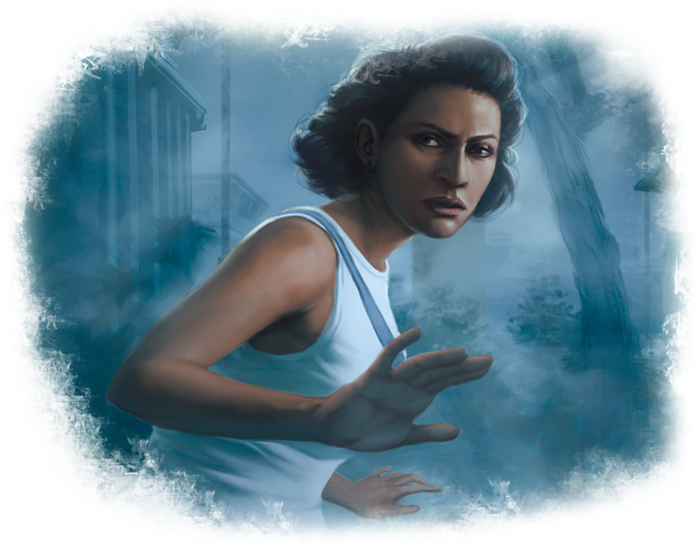 Carolyn Fern made her first appearance in Arkham Horror: The Card Game with the novella To Fight the Black Wind by Jennifer Brozek. But while her ability and skills are the same, Carolyn gains a new signature asset and weakness with her official debut. The good doctor can amplify her healing prowess with Hypnotic Therapy (The Circle Undone, 7). As an action, Carolyn can test her intellect, healing one horror from an investigator at her location and allowing them to draw a card if she succeeds. 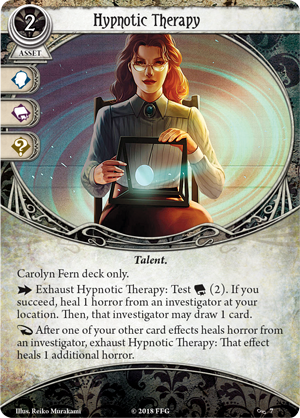 But even more than that, after one of Carolyn’s other card effects heals horror from an investigator, she can exhaust Hypnotic Therapy to heal an additional horror—if she can't spare an action to use this card, she can still apply her skills as a psychologist and bring her allies back from the brink of madness! Sadly, in a place like Arkham, the Rational Thought (The Circle Undone, 8) that denies the terrors Carolyn has seen may prove her downfall. This Flaw enters play with four horror on it which Carolyn must heal, having the scales fall from her eyes, before she can aid others. Regrettably, the mind is fragile and this may take precious time from your investigations. Still, as the shapes in the mist resting over Arkham continue to shift into maddening configurations, it may prove wise to have a trained professional on your side. Clocks don't lie. In the past, people have said hurtful things to Rita Young. They have threatened her or deemed her inferior. But ever since she started running competitively, Rita has only cared about the clock. The clock says that Rita is faster, better, than the rest. It says she is stronger and has trained harder. Now, instead of running, she may have to fight for her life. Someone is after her, but she has no idea who they are or what they want. But if they want to hurt her, they'll have to catch her first, and the clock says they cannot. 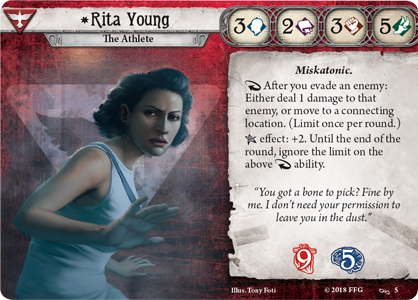 Rita Young (The Circle Undone, 5) is the track star of Miskatonic University, boasting an agility skill of five which ranks among the highest in Arkham Horror: The Card Game. After Rita uses her incredible speed to evade an enemy, she has the choice to either run to a new location or deal damage to her foe before they even know what hit them. And if she draws a little luck from the chaos bag to reveal the elder sign token, she can use this ability as often as she wants during her turn. Arkham is full of dangers, but Rita will do whatever it takes to survive. In addition to her faction and neutral cards, the athlete also has access to Trick cards up to Level 3, opening up a world of possibilities from the Rogue faction. 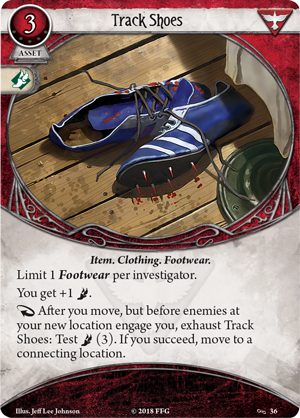 For example, she can use a little Sleight of Hand (The Path to Carcosa, 29) to put Track Shoes (The Circle Undone, 36) into play, raising her agility and allowing her to run right past enemies before they can catch her. 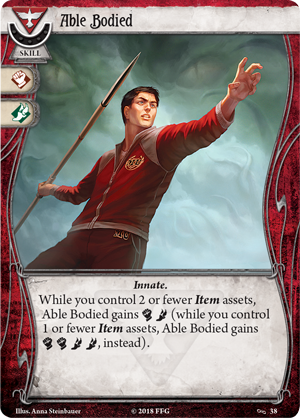 By using this combination, Track Shoes return to Rita’s hand at the end of the turn, which helps her access the full power of Innate cards like Able Bodied (The Circle Undone, 38), which becomes more powerful the fewer Items she has weighing her down. 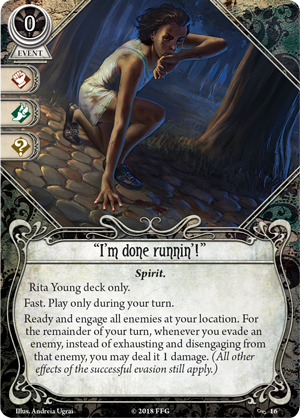 While her power may lie in outrunning danger, Rita can change her course to declare "I'm done runnin'!" (The Circle Undone, 16), engaging all enemies at her location. Then, for the remainder of the turn, whenever she evades an enemy, rather than exhausting and disengaging, she deals one damage instead. When combined with her investigator ability, Rita can run circles around a host of enemies, dealing damage with each evasion and getting out of harm’s way before they can return the blow. However, this maneuver may not work against every enemy Rita encounters in Arkham. The Hoods (The Circle Undone, 17) who chase her bear both the alert and hunter keywords, and if she should try to evade them, they're ready to strike. Punished for evading, Rita may be forced to rely on her lower combat skill to handle these Cultists. But Rita won't surrender to the fear that these brutes hope to instill. She won't go out without a fight, and most importantly, she is not alone. 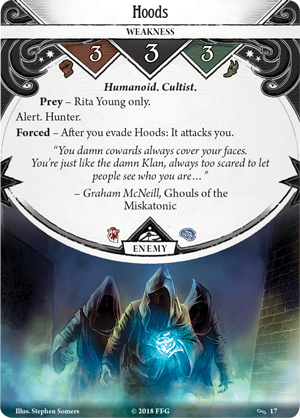 The secrets of Arkham’s macabre past have returned to haunt the city, and now only its bravest investigators can stand between their home and total destruction. Strengthen your mind and body and prepare to face the dangers ahead!